This is off track for the Alzheimer's Reading Room, but I thought you might find this article and the photos from My Modern Met interesting and entertaining. I did. 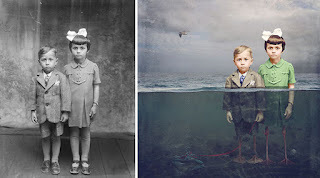 Australian artist Jane Long has created imaginatively surreal compositions by digitally restoring, colorizing, and manipulating black-and-white photos captured over 50 years ago.